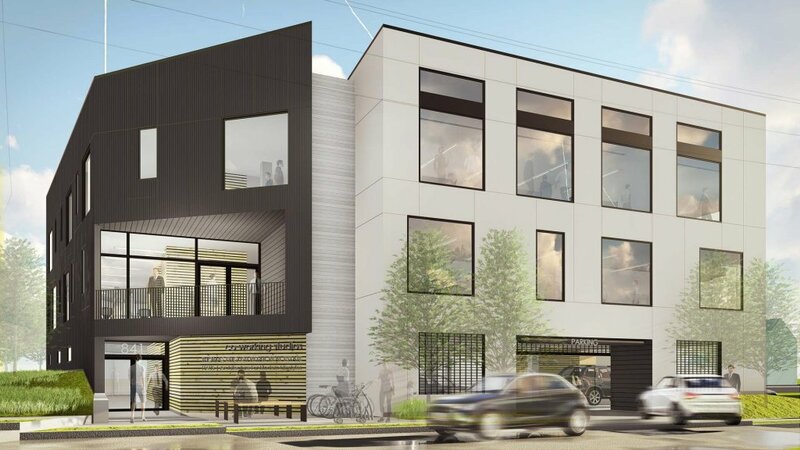 HAUS is working on G BLOC MIXED USE, a new development in Broad Ripple North Village that includes a mix of commercial office, urban lofts, and covered parking and is located on a small city block at 841 E 64th Street. We have enjoyed the public process that began in early 2016 and have been working toward a solution that most effectively meets the multifaceted urban design goals of this awesome location. It has been an engaging and stimulating dialogue with the neighborhood and the City in an effort to balance the desire for pedestrian engagement and more mixed-use density fitting Broad Ripple’s Envision Plan while also managing flood-plain requirements. The location (formerly 6367 and 6371 Guilford) is just a few feet from the Monon Trail and borders Guilford, 64th, Cornell, and Main. 2014-2015 – We most recently became interested in the Broad Ripple North Village area while working with one of our clients to design and build a new brownstone-inspired home on Ferguson Street. This particular client lives in an exclusive gated community in Carmel, and were about to become empty-nesters. For that reason, they wanted to live in a vibrant, walkable community with lots of amenities and restaurants, and acquired property to make that happen. Some immediate plans changed for that project and it went on-hold, but it’s still out there and we are looking forward to a re-engagement. 2016 – We gained control of the properties at 6367 and 6371 Guilford, and began conceptualizing development options. Our first BRVA Land-Use and Development Committee meeting was in March 2016 to introduce initial ideas to the BRVA Zoning and Land-Use Committee to begin a constructive dialogue and gather information. This scheme included 30 loft apartments on levels 3 and 4, office space on level 2, and primarily parking on level 1. BRVA was good about communicating their concerns (parking should be out of sight but enough provided possibly to exceed the zoning requirement, pedestrian engagement is very important, please include a retail component, we don’t really want to knock-down the historic homes on the site, how tall is it, and we’re not sure we like your design quite yet). This was a good introduction to community stakeholders, and we went to work from there to respond to the mostly constructive feedback that we received. Our next round of development focused on concealing the base-level parking and integrating a ground-level retail component per BRVA request. We also had time to develop the architectural concepts a bit more. We could see that parking may be the biggest challenge in enabling enough density for project feasibility. 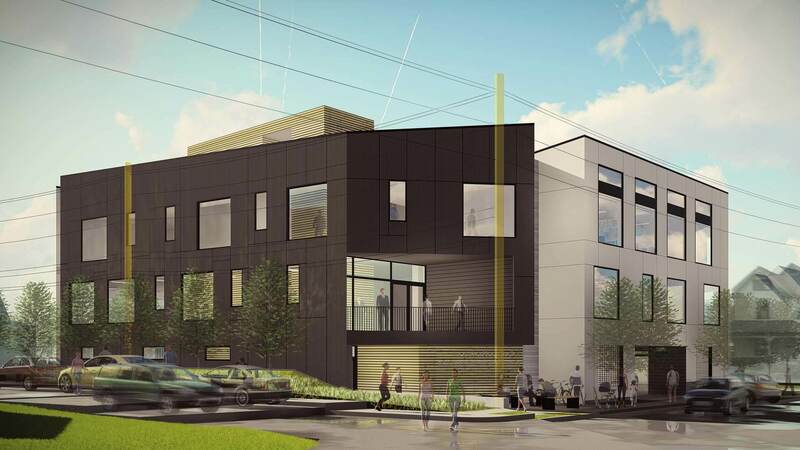 This next concept incorporated a mix of two-story townhomes (possibly live-work), a reduced number of loft apartments, office, small retail or cafe, and parking. BRVA still appeared to have strong opposition to the proposal. For instance they suggested still not enough pedestrian engagement, too massive, don’t want to demolish existing structures, and concerns with parking. Also, BRVA did not appear to consider the significant challenge that the flood-fringe factor will play. On our side, we knew that satisfying everyone was going to a monumental challenge, especially if we counted ourselves and financial feasibility. Architecturally, we began to define what the building should be (in our eyes). BRVA did not agree (“it’s too boxy” “too modern”, “too tall”, “not enough pedestrian engagement”, live-work will never work”). The sites were in zone C-4, which allows up to 65-foot height; however, we proposed to rezone to the new MU-2 Category per Indy ReZone, adopted in April 2016. 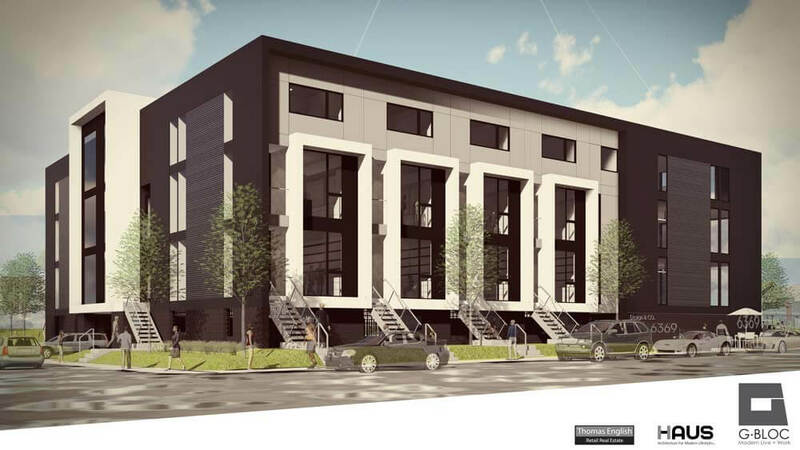 MU-2 allows up to 35′ in height, but BRVA Envision plan recommends up to 4-stories and 40-feet. We ended-up taking a break in summer 2016, and then came back to BRVA in November. We had refined the concepts some, but no major differences from the prior meeting. Some on the BRVA were hoping for more significant design concept revisions. This was our 4th trip to see the land-use committee. From here, we engaged zoning consultants and submitted our applications with the City (late 2016-early 2017). 2017 – Planning staff opposed the development proposal (“too intense for its location”, “parking concerns”). After several meetings, it became clear that staff was not going to support the rezone or variance. Our only chance was to do what was necessary to achieve BRVA support and proceed with the City process. We didn’t expect hearing officer to contradict staff, so we looked forward to Board of Zoning Appeals hearing. So, we went “back to the drawing board” again to see how we could create a more “village-friendly” architecture. We redesigned the exterior for a more “village-friendly” character and scale. In addition to adding gabled roofs, we deleted the 4th floor and raised the main floor to accommodate more storefront. With these changes, BRVA voted to support the project, but only with a long-list of agreed stipulations. Thank you to Colleen Fanning, Thomas Healy, and other local business owners for your support, including writing letters and speaking on behalf of our rezoning efforts. We were not able to achieve City Planning Department staff or hearing officer support as of 08.10.17. On 09.06.17, the Board of Zoning Appeals Commission voted to support the rezone from C-4 to MU-2 (5-3 vote). However, they voted against the variances (building height + clear sight triangle) (3-5 vote). On the bright-side, City did not adopt BRVA stipulations since they did not approve variances. In hindsight, this may have been the most beneficial outcome for this development. We still really don’t understand why staff was against our proposal. Above all, we understood a primary intent of Indy ReZone was to encourage higher-density development in urban areas, discouraging sprawl. The resistance to an additional 5-feet of building height and maintaining clear site triangle is dumbfounding (to us) at best. We documented 40-50 instances in the immediate area that don’t follow current clear sight requirements. And City has approved several new development proposals much greater height, including 70-feet directly across the Monon Trail. The clear-site triangle requirement is automobile-centric, which is contrary to initiatives focused on the pedestrian. Each of the intersections abutting our property have all-way stops; therefore, there is no need for strict adherence to clear sight triangle. Its adherence seems in conflict with the creation of a nicely-scaled pedestrian experience. Despite our initial claims to the contrary, neither BRVA or Planning Department appreciated the significant hardship for developing the site. This hardship pertained to the flood plain and associated FEMA requirements. On the technical design side, this was all a fascinating challenge. On the development side, it was a major hurdle and hardship on most levels. Certain members of the Board of Zoning Appeals tried to coax us to highlight the flood zone hardships more-so. Without a doubt, we didn’t emphasize that issue to our advantage in the variance hearing. We’ll be sharing more about the what we learned during this process, so please check-back for updates. 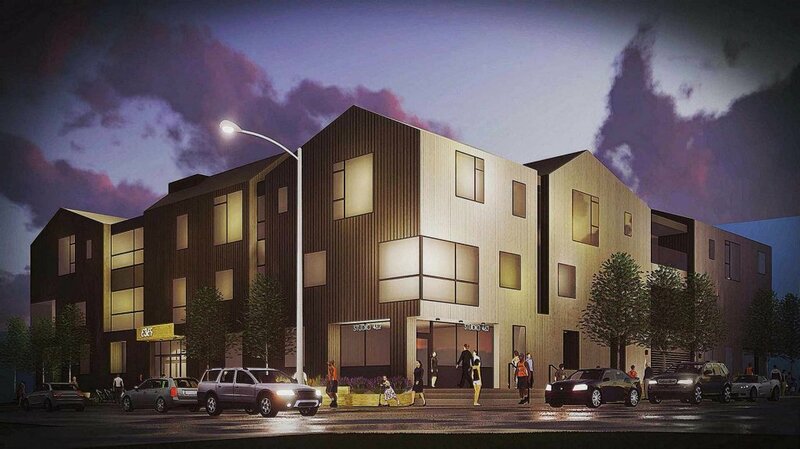 We presented the gable-roof design below to City + Board of Zoning Appeals. Since achieving the rezone, we have developed a completely new design concept (again). This new direction meets the now-defined zoning criteria, including the clear-site triangle, parking, transparency, and height. Furthermore, we have designed the scheme to accommodate a future 4th floor. As we delved deeper into zoning exceptions, we learned to leverage certain components, including skylights, parapets, towers, and surrounding grade. However, we’ll still need a variance for the future story. Zoning rules have forced us to adapt and modify some pedestrian-engagement amenities in favor of other requirements. For instance, height limitations and flood-plain requirements forced us to implement some of our original directions. In addition to sinking the base level partially into the earth, we moved the primary building entry back to the northeast corner oriented to the Monon Trail. Despite the numerous challenges, we are excited about the refined direction as the newest design solution is a true contextual response shaped by numerous forces (physical, cultural, political). As of 12.31.17, we have the newest and final design concepts just about completed. 2018 – During the CD stage, we have made further refinements to the design that we will be sharing soon. Permitting – It was a long, drawn-out permit review process, but finally achieved permits in late summer 2018. We’ll share some of the learning from the permit process another time. We completed site demolition + mass excavation in early October 2018. We are beginning site mobilization for layout and excavation, and will finally be pouring footers by late November. Please check back for updates, as we’ll be keeping this post up-to-date! These are excellent designs! 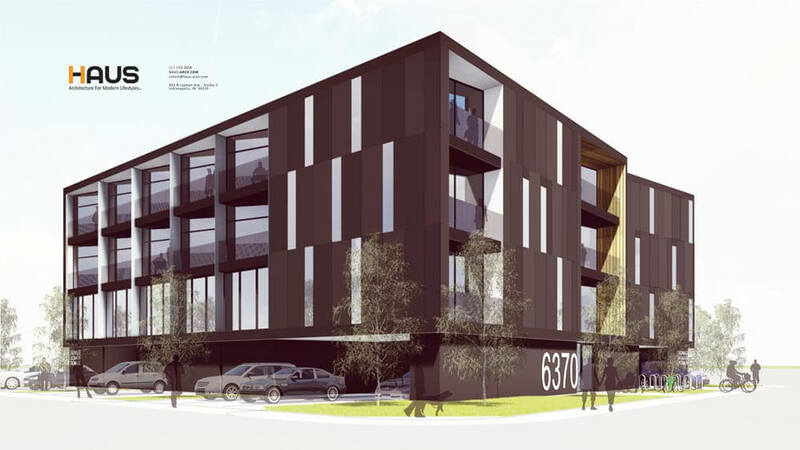 I am sorry that the Broad Ripple Village Land Use Committee did not appreciate or approve of these original designs for the 6300 block of Guilford Avenue. I am a member of the BRVA, and this committee did not speak for me.